Many of the comparisons that will be made about this animated tale will focus primarily on the space-age science-fiction variety because it’s packed to the gills with references to everything from The Day the Earth Stood Still to Aliens to Wall-E to Star Wars and ET. But at its rather sweet core, Planet 51, despite all of the who’s-an-alien jokes being bandied about, the most appropriate and loving homage in the movie is toward the Back to the Future series. The human space captain (voiced by Dwayne “The Rock” Johnson) might be from another world, but he’s really dragging these little green men and women into a brave new future. 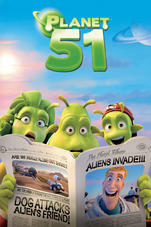 The fact that the 1950s-themed world of the aliens on Planet 51 is not directly referenced as vital to Captain Chuck Baker’s back-story matters little because all of the social and cultural elements on display are broad and general signifiers that everyone knows and understands.